WSDesk is the premier WordPress Helpdesk plugin that offers top-notch features for the best customer support experience. With this plugin, receive all your customer queries, issues, and suggestions in the form of tickets. The plugin is boosted with unlimited tickets, unlimited agents and has features like supervisor profiles, email piping, auto-tagging tickets, auto-assigning tickets, custom ticket submission form, email filtering, email blocking, triggers & automation, quick reply templates, agents’ satisfaction rating and customer feedback and much more!! Unlike other SaaS-based plugins, WSDesk does not store your data in the cloud. Rather, all your data is stored on your system. Data privacy is one less thing to worry about with WSDesk! WSDesk offers no restrictions on Agent profiles and tickets. You can handle unlimited tickets and create unlimited agents profile at no cost. WSDesk’s AJAX based design makes it easier for a support agent to use the whole interface without reloading the page. Bulk changing of Ticket status, Merging tickets, Ticket search & filters, Custom ticket views, and Quick settings for tickets are some of the advantages with which you can make your customer service run quicker and smoother. Create custom ticket views for easy access to Agents. You can create custom ticket views based on Agents, Ticket tags, Forwarded emails, Tickets received only through Form or Email, Imported Zendesk tickets, Emails and much more. Triggers are helpful in setting up automated actions based on various conditions. Agents can receive an email notification whenever a new ticket is raised, or when a ticket is not replied by an agent within a specific period of time. Set notifications to Support Agent for a long-pending ticket. Automatic closing of Pending Tickets for more than configured number of days. Setting different actions for the tickets based on the source like email, support forum or Zendesk. Assigning the tickets to respective Department Agents. Treat your tickets based on the Priority. You can even schedule the triggers for future action using the Automation feature. If you have a dedicated email address of your domain, you can convert your unread emails to tickets using IMAP or Google OAuth. You can delete emails after they are imported to WSDesk. Also, whenever a ticket is raised by customers, an email is sent to them. The customers can also reply to the emails directly, instead of logging into your website & replying through the support form. If there is a standard response for queries, accessible to all support agents, your replies will be much faster. This is why WSDesk provides you an option to create and save reply templates known as "Canned responses" for common queries. Also, Agents have various rich text formatting options while composing replies to the customer as QuillJS is integrated with WSDesk. For analysis purpose, generate custom Agent reports, Date-wise reports for Tickets, Satisfaction survey report, Ticket resolution report, and Reports based on Ticket tags. If you have integrated WooCommerce, a separate tab is created to view ticket reports based on your WooCommerce products and its categories. Secure your existing tickets and settings information with easy backup to an XML file. You can even restore data using an XML file. This process is very helpful if you are moving to a different domain and would like to retain all the tickets and your current WSDesk settings. Once you have integrated WooCommerce, you can retrieve the Total number of orders, Order number, and Total purchase price information in the ticket details of the customer. The products from your WooCommerce store are automatically populated for creating ticket fields and for creating triggers. In addition to this, a separate tab is created for WooCommerce in the Reports dashboard, which shows tickets based on your products and its categories of last seven days. Not just with WooCommerce, WSDesk can easily integrate with Easy Digital Downloads (EDD) as well. The products from your EDD store is automatically populated for creating ticket fields. With the help of our agent signature add-on, you can add a custom signature to your agents and supervisors, in HTML format. This signature will be reflected in the ticket replies (as shown in the screenshot on the right) and emails exchanged with the customers. This will help in your company's brand recognition and also help in redirecting your customers to desired landing pages. With the help of SMS Notification Add-On, you can send SMS notifications to Customers, Agents, and Ticket Assignees. You need to create WSDesk triggers to send SMS notifications. You can create triggers to send new ticket notification to customers & agents, update customers with the current ticket status, and so on. There are a lot of handy features that WSDesk offers and that cater to a much more advanced customization level. Some of these features are Deeplinks, Custom Redirection URLs, Support for several attachment extensions, Export to CSV file for analyzing the data, Integration with Contact Forms & Gravity Forms, WPML compatibility and much more! Auto Tagging And Assigning: Using Triggers, you can use tags to automatically assign tickets to the agents. Auto Suggestion System: This feature allows Agents to select blog articles from the auto-suggested list while replying to tickets. And for Customers, it is shown while raising a ticket. The auto-suggestion feature works on title, content, and tags of the articles. Ticket Custom Views: Based on certain conditions, you can create custom ticket views based on agents, ticket tags, ticket status, and so on. Triggers & Automation: Using Triggers, you can automate certain responses in WSDesk. Canned Responses: If there are several tickets that require a similar reply, you can create a custom template of your own. This will save your time and reduces the effort to type the same message for several tickets. Bulk Edit & Merge Tickets: Bulk edit/update ticket assignee, ticket labels, ticket tags, the subject of the ticket and reply the tickets in bulk. This process will merge tickets automatically. Agents Management: Configure and manage agent roles, their user rights and associated Ticket Tags of each agent. Agent Notifications: Like real-time email alerts, the agents can receive notifications whenever a customer creates a ticket. Not only customer’s action, but a Support Agent’s response to the ticket or even a change in ticket status can trigger the emails. Agent’s Satisfaction Rating: Using Triggers, a satisfaction email can be sent to the customers to request feedback on your customer service. This will also help to analyze each agent’s performance. WSDesk Backup & Restore: Backup and restore the WSDesk settings and tickets data within a specific date range, in simple steps. Change Requester Email: Change/update the ticket raiser’s email address. Unlimited Agents: Create unlimited agent accounts in WSDesk. Customizable Ticket Fields: Create custom input fields for your customer support form. Customizable Support Form: Create custom interfaces for support form. You can also create multiple support forms as well. Multiple Attachment Fields: Customers can upload multiple attachment files while submitting the ticket. Unlimited Days Reports and Analysis: Tracking ticket reports and agent reports are not limited to certain days but can be tracked for any custom duration. Rich Content with Formatting Options: WSDesk comes with a rich text editor with advanced formatting options. AJAX Based System: WSDesk is built with AJAX based design, that helps load information faster. No need to reload the page every time to get updated information. Email Support System: Customers can reply to tickets from their emails. Hence reducing the need to login to your website to reply to the tickets. Advanced Short Codes Supported: WSDesk supports advanced short-codes that enhance some functionality of the plugin. Import Zendesk Tickets: Existing Zendesk tickets can be imported to WSDesk in simple steps. WooCommerce Integration: WooCommerce can be integrated with WSDesk. WooCommerce fields will be used for ticket handling. You can even track WooCommerce reports separately. Easy Digital Downloads (EDD) Integration: Just like WooCommerce, WSDesk also integrates with Easy Digital Downloads (EDD). One Year Support & Updates: Every license of WSDesk comes with a one-year premium support and plugin updates. I’ve tried nearly every support plugin I could find and uninstalled them one by one when I found one problem after another. Then I came across WSDesk and it was like someone had created the perfect support plugin for my needs. I particularly like the excellence of the overall design, great usability, high coding quality, and solid technical support. I had no hesitation in upgrading to the paid version and I expect it to be the technical support foundation of my business for years to come. A well deserved 5 stars. Great job guys and gals! If you require a ticket support system to help your customers, then this is the MUST HAVE ticket system. We had a few bumps in the beginning, but with the help of WSDesk support team, we were able to get up and running in no time at all. Plus they quickly added a feature request that my department really needed to help support our customers. I highly recommend this plugin! Hi there, Just want to give the short review after using the WSDesk for several weeks. I’ve spend several weeks and tried about 8 support plugins to find the best possible plugin for the job.The WSDesk exceed my expectations and provide the solid foundation for the support on our website! What’s really important for us is the fact that their support team is very responsive and willing to help with any request that we have. So I could highly recommend the plugin to anyone who need the best cost efficient and full of necessary features support plugin! Great product, exceptionally good and friendly support! WSDesk is the right tool if you want to offer your customers professional support. The plugin is easy to install, configure and makes the support job much easier. The support of WSDesk is exceptionally fast and competent. Suggestions for further features are quickly recorded and, if they make sense, implemented just as quickly. WSDesk is highly recommended. As a thank you for the great service, I will help to translate the plugin into German. I would give more stars if possible! I am using this plugin to support my web design clients. The support staff offered exceptional support all along while setting it up, as well as adjusting it to fit our growth. This is 100% the honest truth. I have NEVER received such exceptional support as I have received from you guys. Keep doing what you’re doing! You’ve already surpassed all big support system providers with your offer! After the expiry of the license, the plugin will continue to work as normal. However, the download permission will be revoked; so the updates for the plugin will stop. You can always renew the license at a 20% discount, which will be provided on request. I want my customers to first see their ticket view while logging into my site, and then have the option to create tickets. Is this possible with your plugin? Yes, you can use the shortcode [wsdesk_support display=check_request] if you want your customers to see their existing tickets when they log in to your support page. Is the auto-suggestion feature compatible with Knowledge Base plugins like "WP knowledge base"? Yes, Auto Suggestion feature of WSDesk is compatible with Knowledge Base plugins. Can I change the text and color of the 'Submit Request' button? Yes, The color of the button is fully based on your WordPress theme. You can change it through CSS. We can help you to change the text. Please contact our support team. Is there a way to activate WSDesk on our dev server and then remove the activation and reactivate on our live server? Yes, you can find your active license key from WSDesk > Settings > Activate. You can deactivate the license key and then go to the dev/live server and enter the same key and email ID there to activate. You can also find your active license key and email at MY API KEYS section of your My-Account page. Is the plugin supposed to send an automatic reply email when a user submits a new ticket? 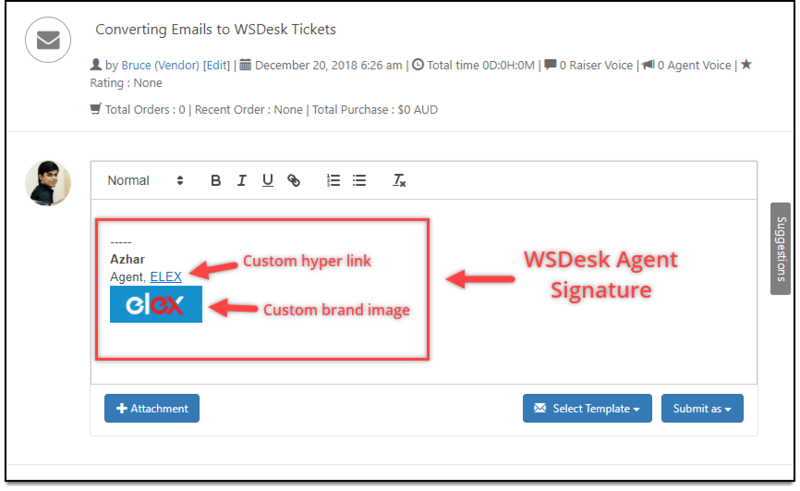 Yes, Automatic sending of emails can be achieved through WSDesk Triggers and Automation feature. Can I configure the system to accept emails? For example, all emails to support@mydomain.com will appear as a ticket? Definitely. It will appear as a ticket. For that, you need to configure your email via IMAP correctly. Your IMAP details will be available in your Domain CPanel -> Email. If you are using Google GSuite emails, then read this article. How do I configure IMAP on WSDesk? Configuring IMAP on WSDesk is very easy. You can follow the steps explained in this article. I have several websites - support@domaina.com, support@domainb.com, support@domainc.com. I would like the tickets to come to the same desk. I also want to tag them based on which email address the ticket was sent to. Is this possible? Of course, you can set up an email forwarding from these different email IDs to the main support email that you wish to set up using IMAP in WSDesk. Now, if you want to create a separate view based on the email from which the ticket is forwarded from, then we do have an option to create a view based on that specific email ID. After users fill out Ticket support form, they get message 'Support Request Received Successfully'. Can I set up a redirect to a custom page? Yes, WSDesk has an option to give a customized redirection URL after a ticket is submitted. Any suggestion on a WordPress Live Chat Plugin which has integration with WSDesk? We have released WSChat – a WordPress Live Chat Plugin based on customer request, which is simple and well integrated with WSDesk. I have been using WSDesk for 1 year and processed 300 tickets for my annual event. It works very well and the team gives great support. In terms of functionality, the plugin covers basic helpdesk functions. The interface of the ticket received from the customers should be further improved, the format is all over the place since the plugin does not support complete HTML. However, the support is very good and responsive. You can expect a fast and thorough, helpful reply from them. Thank you! We were restricting the HTML contents so as to prevent the bad HTML causing security issues or crashing the website. In the latest version of the plugin, based on customer feedback we have included a settings option letting the users enable/disable the HTML contents though we recommend this option being kept disabled. Generally very good, and the support team do a good job. But the documentation is incomplete and confusing. Thanks for the valuable feedback. We will make the necessary changes in our documentation. The team supports bugs and feature requests, that’s nice. Great product. Easy to instal and is to the point. We needed a straight forward ticketing system for our staff to raise issues with and WSDesk does that and very good email integration. Really pleased with the support too which is where a lot of plugins get let down. Also new functions on the horizon so great to see the team is continuing to develop it. Some functional add-ons too. Best support plugin out there for an affordable price! We tested out two or three other support plugins, but were frustrated with all sorts of setup or functionality problems. WSDesk wasn’t without its challenges, but the support was timely and helpful. The basic documentation is excellent, but the excellent triggers feature needs a bit more documentation and explaining. Overall, we are very happy with the plugin and consider it excellent value for money. web design clients. The support staff offered exceptional support all along while setting it up, as well as adjusting it to fit our growth. We’re really bending this plugin to fit our needs. It’s made for support ticketing, but we’re using it for assignments and an instructor/student feedback channel. They’ve been great with their support in getting us there. Great plugin! Had initial problems with IMAP setup but support was quick to look into the issue and issue was on the end of the web hosting company. With their guidance issue was resolved quickly. I went through many plugins for Woocommerce ticket support system and this one is my choice. Great plugin, easy to setup, and great support from the team! Very quick and helpfully support. Great product, exceptionally good and friendly support! WSDesk is the right tool if you want to offer your customers professional support. The plugin is easy to install, configure and makes the support job much easier. The support of WSDesk is exceptionally fast and competent. Suggestions for further features are quickly recorded and, if they make sense, implemented just as quickly. As a thank you for the great service, I will help to translate the plugin into German. WSDesk is by far the best Helpdesk system for WordPress! I love the trigger & automation feature is super powerful! And the support is just awesome! I have to agree with BRUNO and others, a ticket system that does not email the site owner that there is a matter requiring attention is useless. Look forward to doing a higher rating if this is ever resolved. If you require a ticket support system to help your customers, then this is the MUST HAVE ticket system. We had a few bumps in the beginning, but with the help of WSDesk support team, we were able to get up and running in no time at all. Plus they quickly added a feature request that my department really needed to help support our customers. I highly recommend this plugin! I built my website. Attracted customers. Generated revenue. But I was struggling with the best way to provide online support/ticketing to my customers. I looked at several possible solutions before finding WSDesk. What a difference! Easy. Simple. Effective. And I’m thrilled with the support. I highly recommend you give WSDesk a try. You won’t regret it. Beautiful & Simple Interface. Setting are also easy. The support is very quick. Worth to recommend. I’ve tried nearly every support plugin I could find and uninstalled them one by one when I found one problem after another. Then I came across WSDesk and it was like someone had created the perfect support plugin for my needs. I particularly like the excellence of the overall design, great usability, high coding quality and solid technical support. I had no hesitation in upgrading to the paid version and I expect it to be the technical support foundation of my business for years to come. A well deserved 5 stars. Great job guys and gals! The plugin works really well. I had some issues with setting up and needed some help with this. The customer service is fast and managed to help me with all the issues I had. Great plugin! Just want to give the short review after using the WSDesk for several weeks. I’ve spend several weeks and tried about 8 support plugins to find the best possible plugin for the job. The WSDesk exceed my expectations and provide the solid foundation for the support on our website! What’s really important for us is the fact that their support team is very responsive and willing to help with any request that we have. So I could highly recommend the plugin to anyone who need the best cost efficient and full of necessary features support plugin!